Wall Street got off to a strong start of earnings season as US indices edged higher on Friday at the back of positive bank earnings, and upbeat Chinese data uplifted global sentiment. Moreover, rising treasury yields reflected risk appetite for US equities and while corporate reports will be the determinant of the near-term outlook, US-China trade progress remains a catalyst and weekend reports of resolving the prolonged trade dispute has kept hopes of a trade deal alive and should buoy market sentiment this week. On today’s data front, US publishes NY manufacturing index forecasted to rebound in April however traders will mainly focus on earnings reports to impact price action on the Dow. The Dow Index made a notable jump of 1% to end at a high of 26412 on Friday. The index exited range bound price action and gained significant ground to move closer to this month’s high around 26480. Overcoming this level would signal the continuation of the bullish trend and bring into view the all-time high at 26940. 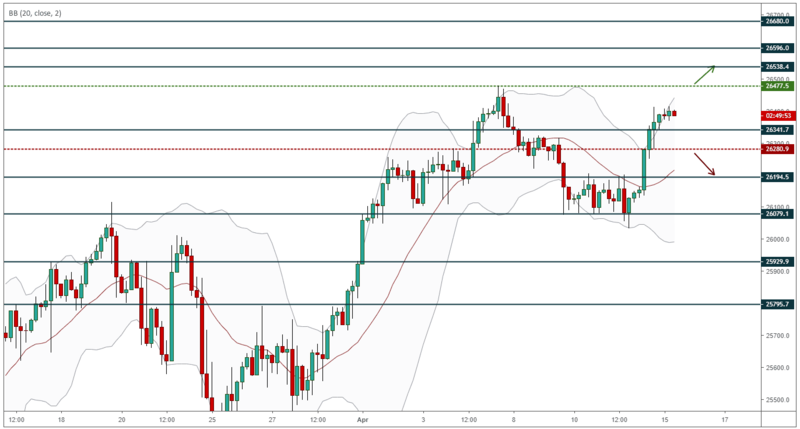 Main support can now be found around the 26270/26280 zone, with a trade through the 26340 level required to signal a lower move as the index may range above this level before edging higher towards resistance at 26480.